Krubad "the feathered" Killer, spreading human warmth. Ink and copics on paper. For the big Gr'nn suitcase project. 40 pages of the re-emergence of Temper captured in good old-fashioned paper form, copperbound and homebrewn right down to the last staple. Shoot me a line if you want to order a copy. 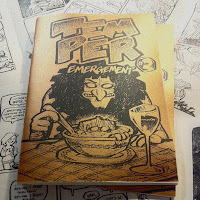 Temper's first adventures were bundled in The Soup Of Existence (1996), which is readable in it's entirety online. 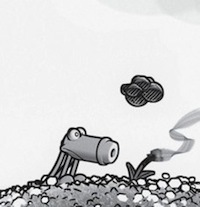 VFX artist and animator drawing comics and thelike for fun and adventure.